Incorporated in 1994, Hume City is a fast-growing municipality north of Melbourne. This rapidly expanding community required a library, learning centre and gathering space to serve as a public community focus. The selected site was open in character and surrounded by an expanding series of new housing projects and retail development. We envisaged the project to become the built focus of public life for the Craigieburn community and also sought to connect the architecture with the landscape that is being rapidly transformed by residential expansion. The native vegetation and indigenous materials of this landscape are being replaced with imported brick, concrete and tiles that characterise new housing development. 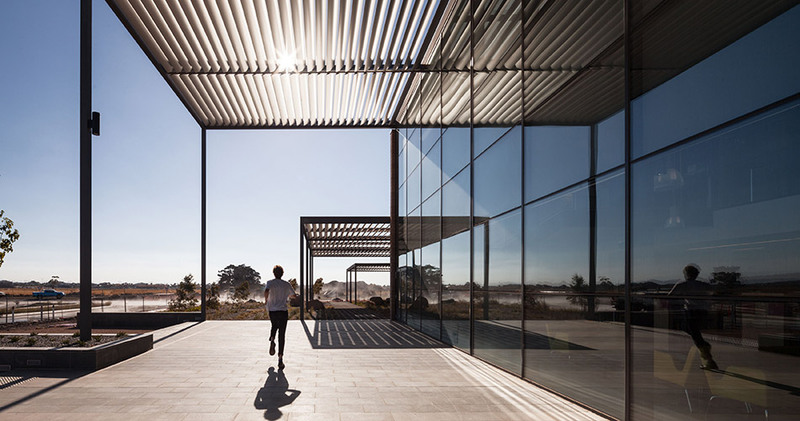 In contrast, the project utilises locally sourced earth as the primary building material, establishing a high-sustainable, green agenda and setting a new benchmark for the growing township of Craigieburn. The building is conceived as a series of interlocking pavilions of varying height and scale that step down from the entrance, accommodating a two-storey, central library reading space and the lower scale of the children’s library. Each pavilion extends into the landscape through louvred roofs that create a series of northern verandahs. The cruciform circulation through the building ties these functions together in a highly legible, simple geometry. The primary reading room consists of a double-height volume with excellent access to natural light, with reading areas positioned along the glazed northern façade, protected by high-level, directional roof louvers. 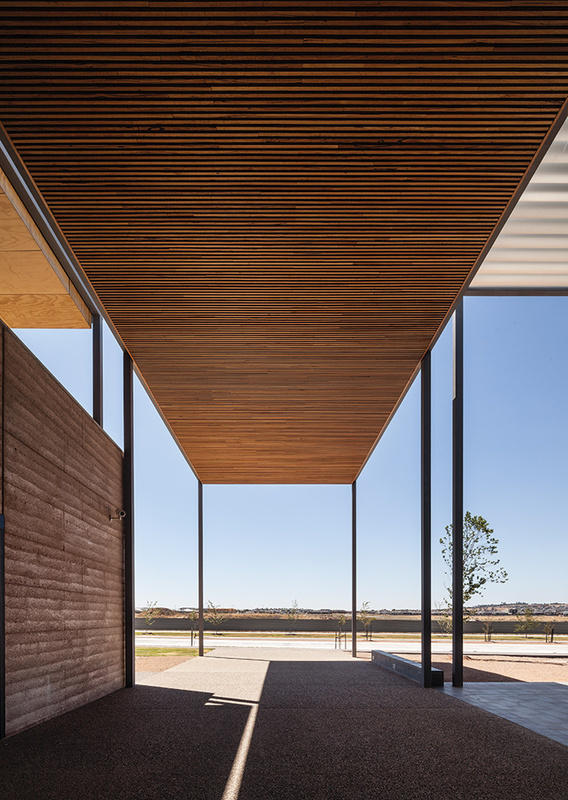 The lightweight steel and timber-trabeated roof structures are complemented by the heavy rammed earth walls that form the enclosure and connects the building with the earth upon which it sits. 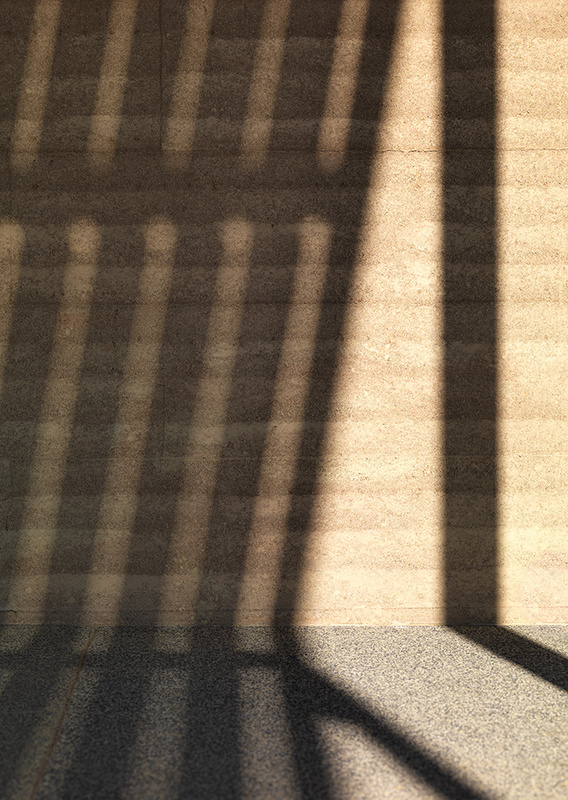 Through the rammed earth, we are seeking a direct transformation of the ground of the site into built form, in a sense wrapping the earth of the site around the lightweight verandah like pavilions that open out to this extended horizontal landscape. 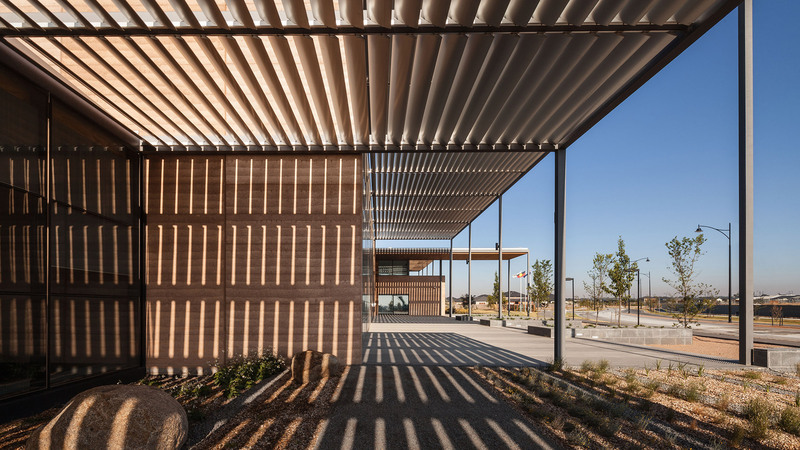 Within the shade of these louvered verandahs, community activities such as markets and music functions occur, as well as the natural spill of activity from within the library. In addition to the core library services, the project includes an integrated local art gallery, café, childcare centre, computer training centre and meeting and function spaces. 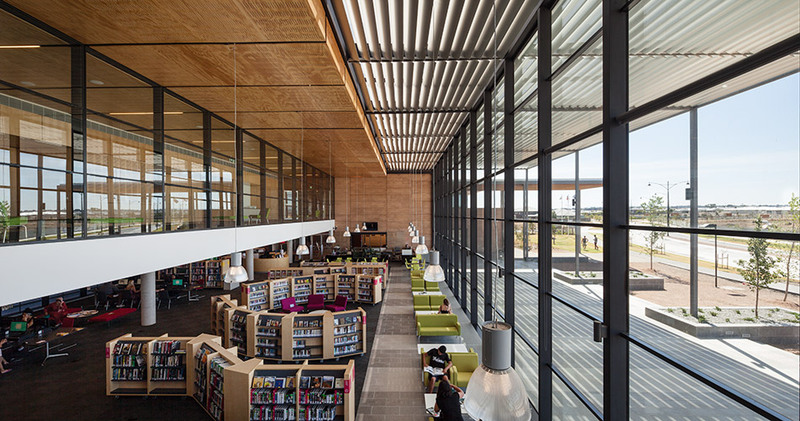 The library is a key public building for Craigieburn, and will continue to bring people together and act as a focal point for the community in a warm, friendly and sustainable environment.